After a long break, we’re back in mountainous Basque country – País Vasco – continuing the theme of woodwinds that aren’t particularly well-known in the West. As I’ve mentioned before, I’m always amazed at the variety of Spanish folk music captured on 78. According to Paul Vernon in Arte Regional, it’s quite possible that no other single country except for the United States had such a wide range of regional styles. The fact that such a broad palette of recordings were made makes sense for several reasons. First, Spain was quite accessible in the early 20th century by record companies in operation in Europe (England, Germany and France – and Spanish independents). But second, and just as important, many of Spain’s rural regions, while comparatively close for engineers to travel to, were remote, autonomous communities. Real roots music was recorded in Spain during those years. Well, phenomenal roots music was recorded throughout the vast majority of European countries during this period (with a few notable exceptions) and it’s all tough to locate, let’s face it. The txistu is the three-holed, Basque wooden flute, which can be held and played with one hand, so the player can usually play a drum at the same time. 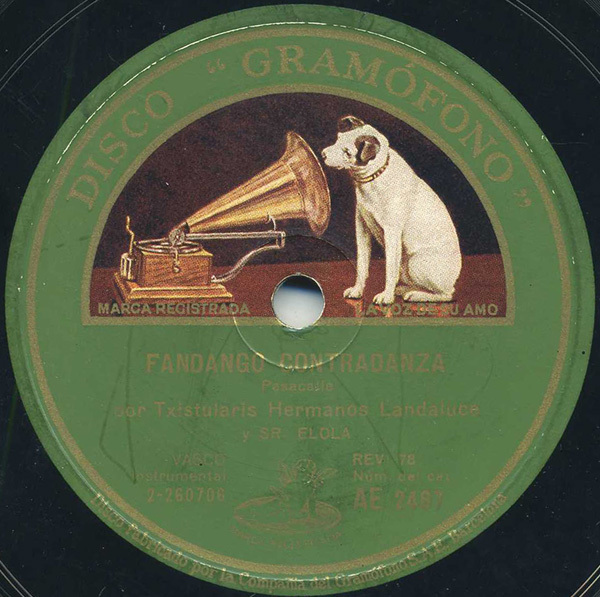 Instrumental Basque music during this period was used mainly for dancing – which is obvious in the title to this track, “Fandango Contradanza.” To many listeners this music might sound like processional or formal fife and drum music – but indeed it is authentic, traditional folkdance music. The Txistularis (“txistu players”) Hermanos Landaluce were a trio, it appears – with Sr. Elola on the tamboril drum, I’m betting. They recorded this and several other tracks in Barcelona, on December 12th, 1928, for HMV. Gramophone’s engineer for this session was H.E. Davidson, the man who managed to record some of the most important Spanish folk music in history – peasant songs from La Montaña, Valencia, and Asturias, actual cave-dwelling gypsies in Andalucia, a true, live “Saetas” flamenco recording made from a bell tower – radical stuff for the company used to planting recording horns in front of Caruso and Chaliapin. Not that you would know it, as next to none of it is available in any format today. One person did notice the music at the time, however: Rodney Gallop, a British ethnomusicologist before the term was coined, was particularly interested in music from Spain and the Basque region (his Book of the Basques, originally published in 1930, is still in print today). Gallop was one of the first – perhaps THE first – person to champion international folk musics on commercial 78rpm records and it’s a shame he isn’t known more today. He had his particular tastes for sure, but his series of articles for The Gramophone in the 1930s are pieces I turn to for inspiration, once I had read of their existence (thanks to Paul Vernon’s articles and books mentioning Gallop, I found copies of my own). In fact, in the November 1930 issue of The Gramophone, Gallop recommends two Basque recordings by this very band, including this record, to his staid, British audience. For more of Gallop’s legacy and Spanish regional music from this era, seek out the Voice of Spain CD on Heritage, the only broad collection of Spanish regional 78s from this period that I know of (though there are 3-4 nice cuts scattered about the Secret Museum series). Unfortunately, while it contains terrific music from nearby Asturias and Santander, it does not contain any of the Basque recordings that Gallop loved so much. You said “phenomenal roots music was recorded throughout the vast majority of Europe during this period (with a few notable exceptions)”. I don’t know much about European music during this period (beyond what I have learned from your blog). What are the notable exceptions that you mentioned? That’s NOT to say that roots music wasn’t recorded in those countries by European companies during that period of time – it’s just generally considered true that the most important roots music stemming from Poland and the Ukraine during those years was recorded in the U.S.
Interestingly, given what you relate about the Englishman Rodney Gallop’s activities in the Basque country, one of the countries where there was virtually no roots music recorded commercially during the period in question was England. Scotland was, of course, a different story, and Ireland even more so, although in the latter case a high proportion of the records – but not all – were US imports. A few bits and pieces of decent traditional English music (e.g. William Kimber, George Tremain) did appear on HMV 78s, courtesy of the English Folk Dance and Song Society, but its target audience was not the communities from which the music came. You could make a case for describing a few odd records in the commercial lists as being authentic folk music (Albert Richardson’s “Buttercup Joe” on Zonophone 5178 is one that is sometimes cited), and there’s also possibly a debate about the many, many records of urban popular music which were recorded, some of which skirted the edges of folk music (e.g. concertina virtuosos from the music hall stage, like Alexander Prince and Percy Honri, doing elaborate versions of traditional dance tunes). But there’s no English equivalent of most of the recordings you post here. This week’s is yet another beauty. You are absolutely correct – thank you for bringing that up. That’s something that slipped my mind in writing the comment above, pertaining to Poland and Ukraine. My familiarity with English folk music came from those very Folk Dance and Song Society 78s you mention. Though I have very little of that music in my collection, I do enjoy it – and after all, in a sense, it’s all that we have! I should mention my favorite folk song of all time from the United Kingdom. The wonderful unaccompanied singing of Welsh octagenarian Phil Tanner, performing “The Gower Wassail Song” ca. 1932 or so. To me, that song is just stunning. I tracked down a clean, original copy – but it’s available on CD now, so I won’t post it here. But for some reason I really am moved by that piece. I’m delighted to see my grandfather commemorated on here! Thanks, Cindy! So glad to hear from you, and the pleasure is mine. somebody has any knowledge of a LANDALUCE? I’m Jone Landaluce. My grandfather was txistulari and I know he played with his brothers. hi jone, please contact me in this mail: hektorxabier@yahoo.es, I would like know your history and look if I can help you…..
Hi Jone!, It’s me Iñaki, I’m Landaluce, from Orduña (Bizkaia), I’m descendent of the txistu player Landaluce family, they were from there as well (from Orduña). You must live abroad from Basque Country, because Landaluce first name is quiet common here, so, what are you interested in?, could I help you?. Agur!